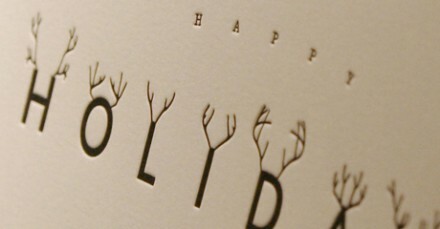 Graphic Design | TDC: Letterpress Your Own Holiday Postcards! Spread holiday cheer in style! Join with Earl Kallemeyn of the Kallemeyn Press for a two-part, hands-on letterpress workshop. Participants will learn the fundamentals of letterpress printing from polymer plates while producing their own two-sided holiday postcards. The workshop will kick off with an introduction to letterpress printing by Mr. Kalleymeyn at the TDC—covering printing fundamentals and basic file preparation. Part two of the workshop will take place at the Kallemeyn Press in Brooklyn. All participants will create 100 (4 x 6″) letterpressed holiday postcards printed on high-quality paper. Register now! Fee (includes materials): TDC members: $305. Non-members: $380. Advance payment required (by check or credit card). Cancellation fee:$50 for cancellations less than two weeks prior to the class date. To register online, click here. Requirements: All participants must be able to create a PDF of their business card design. Specific requirements for the PDF file will be provided at the first session.